If you're looking for information on storage auctions in Houston, Texas, you're in the right place. 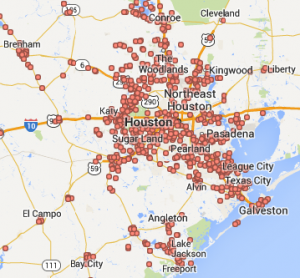 We publish the schedule for every storage auction occurring within the greater Houston area. The map to the right shows our coverage area. Did you know that there are multiple storage auctions occurring almost every day of the week in the Houston area? On average, we provide the schedule for over 300 storage unit auctions every month, including storage auctions that are unavailable on any other website. Our call center directly contacts over 1400 storage facilities in order to provide you with the most reliable and up to date information available. Our storage auction list provides you with the name, address & phone number of the storage facility, the time and date of the storage auction and the number of units scheduled for public sale. We present this list to you in an easy to read, PDF format. You can print out your auction list for the entire week with one click of a button. The facility above is selling a flat screen TV. The facility above is selling a jewelry box, a pool table and a guitar. The facility above is selling a pressure washer trailer, a generator, kids four wheelers and a safe. The facilities above are selling modern & mid-century furniture, antiques and collectibles. We realize you want to spend your time at the storage auctions looking for some good deals, not doing research. Let us do all of the research for you. We will save you time and money. Join now and you'll get our e-book, The Storage Auction Pro, absolutely free. This e-book will teach you everything you need to know to be successful in the storage auction business. 62 storage facilities are having an auction this week in the greater Houston area. Click the button below for instant access to the auction lists and e-book.